I’m currently enjoying season 2 of Fargo on Netflix. 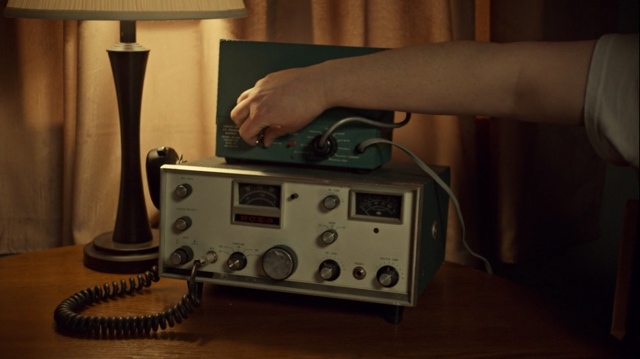 This radio popped up in episode 9, in use by the South Dakota police. Sharp eyes, Mark! I’m impressed with the number of radio sightings you find in present-day TV and film. This entry was posted in Art, News, Radios, Shortwave Radio and tagged Fargo, Mark Hirst, National NCX-3, Netflix, Radios in Movies on February 16, 2017 by Thomas. On a roll, I spotted another shortwave radio [in a different scene]. You’ve got sharp eyes, Mark! Thank you for sharing. Can anyone identify the solid-state receiver in the second screen shot? I know I’ve seen this model before, but I can’t recall the make or manufacturer. This entry was posted in News, Radios and tagged Helix, Mark Hirst, Netflix, Radios in Movies, Sony ICF-SW7600GR on January 25, 2017 by Thomas. This shot of some Heathkit radios came up in the first episode of “Stranger Things”. The teacher mentions the brand by name, having sourced them for some enthusiastic school friends who then proceed to talk straight into the mike without any kind of call sign. I’m guessing none of the gear was turned on at that stage. Thanks Mark! There’s no mistaking the classic styling of Heathkit! This entry was posted in News and tagged Mark Hirst, Netflix, Radios in Movies, Stranger Things on October 1, 2016 by Thomas.